Organized by a range of partner organizations, the following trainings, workshops and webinars offer tools for unleashing the power and possibility of nonviolent change in our lives, our communities, and our society. These trainings explore many facets of the vision, principles and concrete methods of active nonviolence, often integrating role-plays, exercises, story-telling, small and large group discussions, short presentations and journaling. Participants are introduced to the vision and methods of nonviolence by exploring: the creative power of nonviolence; the dynamics of violence and nonviolence; practices for nonviolent living; tools for communicating nonviolently; and/or the process and effectiveness of principled and strategic nonviolent social change. Examples: Nonviolence 101 Training; Active Nonviolence Introductory Workshop. Click here to see trainings scheduled in this category. These trainings build skills for changing our communities, our society and our world. 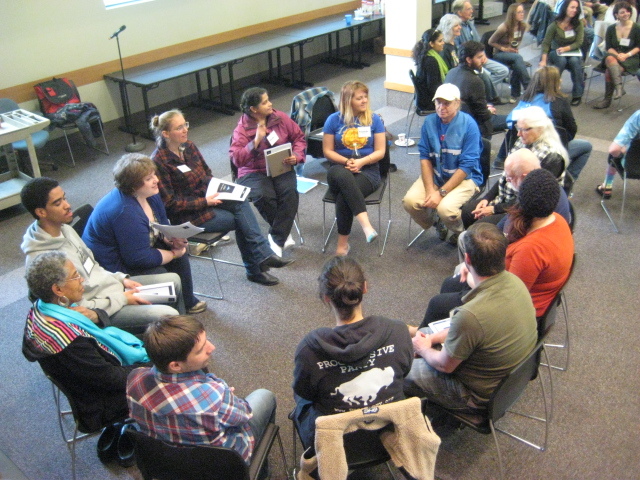 These programs include trainings on: models of successful nonviolent social change; the philosophy, dynamics, history, and effectiveness of nonviolent action and civil resistance, including nonviolent civil disobedience; concrete strategies for building campaigns and movements; creating a culture of peace and nonviolence; domestic violence advocacy training; and connecting personal, interpersonal and social change. Examples: Nonviolent Action Training; Social Change Skill Building; Nonviolent Cities Training. Click here to see trainings scheduled in this category. These trainings focus on applying nonviolence for more effective communication and relationship-building, often with a focus on active listening, I statements, non-defensive approaches, and identifying the needs of both parties. Examples: Nonviolent Communication (NVC); Powerful Non-Defensive Communication (PNDC); Compassionate Listening. Click here to see trainings scheduled in this category. Trainings in unarmed peacekeeping, conflict resolution and restorative justice trainings. Examples: Restorative Justice Peace Circles; Nonviolent Trauma Healing; Domestic Peace Team Training; Mediation Training. Click here to see trainings scheduled in this category. These trainings explore nonviolence rooted in the teaching, principles, and practices of specific faith traditions and spiritualities. Examples: Awakening Soulforce; Gospel Nonviolence Training; Engaged Buddhism Workshop. Click here to see trainings scheduled in this category. These trainings prepare individuals to facilitate nonviolence programming including trainings, workshops, classes, webinars, etc. Examples: Training for Trainers Weekend Workshop. Click here to see trainings scheduled in this category.